Over 24 plastic models, including 5 new monster types and 6 new heroes! New traps and dungeon features, including crushing walls, corrupted terrain, dark glyphs, and more! New hero abilities of all sorts, including two new familiars! An entirely new campaign of perilous quests! A new type of potion! New Overlord cards, using the Treachery rules introduced in Well of Darkness (and reprinted here for your convenience). New treasures, more powerful and more dangerous than ever before! More dungeon tiles make for even larger dungeons! Long ago, foolish men worshipped a malevolent power that lurked just beyond the edge of the light. Now, they work to awaken their dark master once more. If they succeed, it will mean the end of all you hold dear. So, while lesser men quail in terror, you must take up arms to defend the world against those who would enslave it forever. The dangers that lie ahead of you are not for the faint of heart. Deadly crushing walls, unspeakable curses, and assassins cloaked in shadow will try to claim your life long before you ever reach the corrupted temples of Zorek. However, if you're lucky enough, you just might find some help in unexpected places. 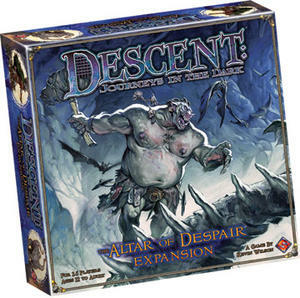 Descent: the Altar of Despair includes more than two dozen new plastic miniatures, featuring six new heroes and five new kinds of monsters. Heroes have powerful new skills and treasures to discover, while the Overlord gains a host of deadly new tricks and tactics, including dark glyphs and relics.